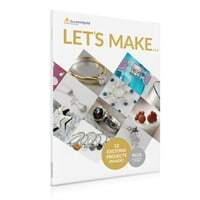 You can get yourself a free Jewellery making guide titled ‘Let's Make' and this guide will teach you how to make jewellery from scratch. Follow our link and get your free guide right away. Click on “GET IT HERE” button and then follow instructions given above to get this free jewellery making guide.